Written by Peter Conrad The last time I wrote, I was in Grande Beach, south of Tamarindo Beach in Guanacaste, North Pacific Coast. Grande Beach is a perfect spot for surfing, with the same great waves that you find in Tamarindo, but in a quieter, lonely beach. I continued my Costa Rica vacations travel near Tamarindo, to another beautiful beach called Langosta (Lobster). Langosta is an exotic beach, with a rocky shoreline, pockets of sand, and pristine water with the color of the sky. It is another great place for a Costa Rica surfing trip, although it is crowded at some times of the year. 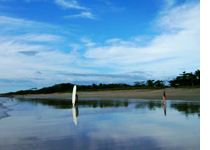 Langosta always attracts surfers from Tamarindo, as well as tourists and locals enjoying the beauty of the area. The estuary is close to the beach, separating Langosta from Grande and Tamarindo beach. It is close to the Las Baulas National Park, a protected zone and one of the most important nesting places for the leatherback sea turtle in the Americas. If you come between October and March, you will be able to see the egg layoff in Las Baulas. To the east and south sides, you can see beautiful mountains. Other activities that you can enjoy in Langosta, are world-class sport fishing, windsurfing, snorkeling, horse back riding, biking and mountain bike. The weather is perfect during the year, with the occasional rain in the afternoon during the rainy season. You will find someCosta Rica Resorts and restaurants in Langosta, but if you look for a place to stay with more services, go to Tamarindo, it is a short distance between the two places. The three beaches in the Tamarindo area, which are Tamarindo, Playa Grande and Langosta, are a place where you must go if you are coming to a Costa Rica getaway. There’s everything from a great day activities, adventure for a Costa Rica family tours, great places to stay and eat, beautiful views and great nightlife in Tamarindo.